Not as quickly as it had done in the dry-run a week before, but nonetheless, I set up an event in the system just by sending a tweet. I was inspired at that moment to make it something close to home. I’ve just moved to Wandsworth and Wandsworth Town railway station has just got new ticket machines and ticket barriers. However, it doesn’t have new bins handy to deal with all the unwanted receipts and other tickets that get left behind in the mad commuter rush. These tickets just pile up and don’t seem to be dealt with by station staff or the streetsweeper. There’s a choice of solutions: ignore it and hope someone else will do something about it; write to South West Trains who manage the station and Wandsworth Council to encourage them to do something about it; or use a newly minted social website to arrange to meet some people there and take a small broom and clear it up yourself. So I used this as my example in the demo and set up for people to come along this morning to pick up tickets. Of course I did nothing further to organise people yesterday as I was mostly dealing with other people using the site, and so no-one else came. Except my long-suffering girlfriend, a bit embarrassed that I’d brought the tatty dustpan brush that was supposed to have gone in the rubbish itself. But I was undaunted – I’m used to playing Billy No-Mates when things are in their early days. 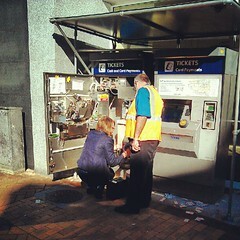 When we arrived, as luck would have it, the station staff were refilling the ticket machine. You can see the mess around the front. It’s clearly not their job to clear that up at the same time. Hmmm… it looks as though I picked up less than I left behind, but that’s not the case, the perspective on that Sainsbury’s bag is misleading. Anyway, you can do better than this – go and organise something in *your* neighbourhood!